Well, I have not been keeping up with my posts, but thought I would sit and write a few lines. We do have some fun stuff in the pipeline. The first Track 7 cigar we did sold out almost over night. Truth be told we only produced a couple thousand, as a test, but they flew out. (test was a success) So, we have more in the works and will have them here next month. We are also rolling a 6x70 under the Track 7 label. Not a ring gauge I'd smoke, but we have had many requests for a 70. The reason for the Track 7 label is I wanted a "testbed" if you will. 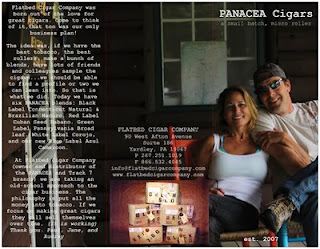 PANACEA has a great following and folks know what to expect from that label/brand. However, I wanted to play around with some different shapes, blends, and sizes....that were outside the box for PANACEA. So, Track 7 is going to be the unwieldy label while PANACEA will continue on it's own interesting path. PANACEA will see new blends, shapes, and sizes too....but within the PANACEA profile. Many folks have asked about the origin of the Track 7 name. It actually came from my daughter and I noticing most of our favorite songs (on a CD) seem to land on the 7th Track. I know, I know....nobody listens to CDs anymore....but I do. I have a ton of them, and have not yet digitized. Anyway, we do many road trips here and there and both love music. One day it hit us how often our favorite song was on Track 7. The box you currently see on our website (for Track 7) has a picture of a RR track. Next month you will see the original box. I recently had a survey done and the original box was chosen over the RR track box. So, you can see it next month when we are back in stock with the maduro Track 7 2:46. PS. Wait until you try the new Pennsylvania Broad leaf Double Ligero! Wow....you're gonna be in love.